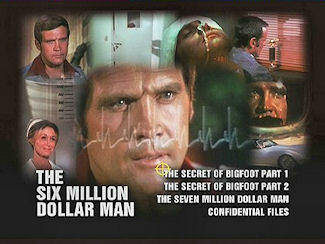 April 9th 2001 saw the first DVD releases for The Six Million Dollar Man and The Bionic Woman in the UK. Both series has had several video releases over the past 24 months from Universal-Playback, but this is the first issue of the shows on the new video format DVD. When the discs load there is a nicely animated menu on each disc, with the SMDM disc benefiting slightly from a collage of moving images against one main changing image on the BW disc. Each menu is accompanied by a shortened version of the main theme. As expected the disc is sparse on extras, however there is a "Confidential Files" section which gives several pages of background on both the shows and Lee Majors and Lindsay Wagner, on the respective discs. This is a nice little bonus, although seems aimed at new-comers to the shows as a way of familiarising them with the characters and stars. One should not look a gift horse in the mouth, but a few trailers and perhaps TV Spots on the discs certainly wouldn't have gone amiss, and perhaps even an episode guide could have been included so it would be possible to see where the stories on the discs featured in the shows' run. This is only a minor quibble, and something that perhaps they are looking at should their be further releases. How do the discs play?. Great!. The pictures are clear, with fresh, bright, colours and the sound is superb, with dialogue and music pin sharp and digitally precise. The shows' opening credits have never looked, or sounded, better and if you have a big screen TV and a sound system hooked up to your DVD player you'll think you've died and gone to heaven as the opening few bars of the main theme start up. I've got to say I tried the SMDM disc first and had to play the titles 4 times over, I just wanted to look at them again and again. You really haven't seen the titles properly until you've seen them on DVD. As for the episodes themselves, they are an odd selection. 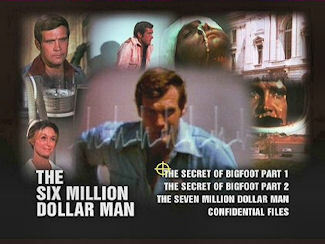 The SMDM disc features The Secret of Bigfoot 2 parter, which has previously been released on video as part of "The Action Men" box set last October, and The Seven Million Dollar Man. I'm not sure why the Bigfoot story was chosen, although perhaps it is an easily identifiable character for people not regular fans of the show, however I would have preferred a new 2-part story or any of a number of excellent stand-alone episodes which the show produced in it's first couple of years. Each episode is complete with opening and closing titles, and it's pleasing to see the 2nd part of the bigfoot story features the original Richard Anderson-voiced "Previously on The SMDM" lead-in at the start of the episode. The Seven Million Dollar Man story features Monte Markham (who fans may know was in the running for the role of Steve Austin, since immortalised by Lee Majors) as Barney Miller, Oscar and Dr. Rudy Wells 2nd cyborg creation. There is plenty of Bionic action with a nice finale slug-fest between Steve and Barney and a touching Steve/Oscar relationship moment right at the end when Oscar speaks to Steve as his "friend" rather than his "boss" - something that was exploited more on The BW due to the almost father-daughter relationship that developed between Oscar Goldman and Jaime Sommers. The BW disc seems to feature an odd selection of shows: Black Magic featuring a host of aged guest stars - Julie Newmar and Vincent Price; the celebrity-guest-starring Motorcycle Boogie with an almost non-acting performance by Evel Knievel, and the lack-lustre Jailing of Jaime. I didn't feel any of the stories showed off what was best about The Bionic Woman - the action, the adventure, the softer female-side to Bionics, although it is difficult to find fault with Lindsay Wagner in any of the stories as she shines through even the weakest of them. The Evel Knievel story features little plot and is just an excuse to try to boost ratings with a "topical" (for the day) celebrity guest and alot of motorcycle stunts/scenes - if they'd made it nowadays they'd have had a WWF star in the role (shades of The Rocks appearance on Star Trek:Voyager the other season!). I find it difficult to comprehend how the collection of 70's celebrities would prompt buyers, other than hardened fans, to part with their money. Surely episodes with a more Sci-Fi/Bionic feel would have been better - such as an episode with Max the dog (I know, but I like the mutt, sorry), or one of the third season sci-fi stories made to take advantage of the then, new, Star Wars craze. What about a good 2-part story such as Doomsday is Tomorrow or Deadly Ringer, as on the SMDM disc. I feel a stronger line-up was called for, for Jaime's first outing on DVD.